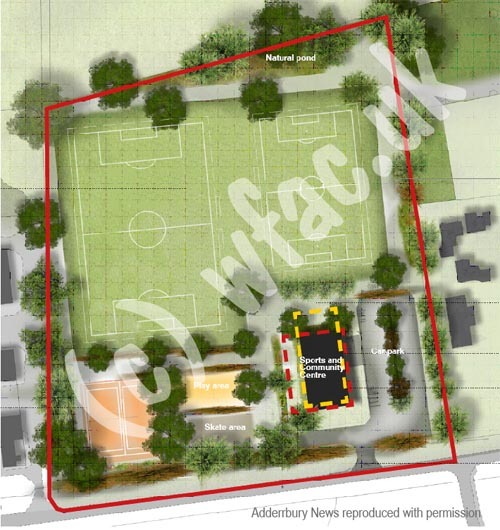 Exciting plans for the design of the new Milton Road sport and community field have been unveiled by Working For Adderbury Community (WFAC). The group, consisting of village volunteers and Parish Councillors, will now present its findings to the Parish Council. Provision has been included for an adult and a junior football pitch, a multi-use games area (MUGA) to include tennis, netball and basketball and a trim trail around the edge of the field to facilitate runners and keep fit fans alike. The design also includes a play area and skate ramp, which has been requested by village youngsters on a number of occasions dating back to the 1990s. WFAC members have been keen to embrace the views from those living close to the new site and have included a pond in the north-east corner which has two functions. Whilst the pond will serve as a nature led focal point, importantly it will also act as a natural balancing pond to restrict the flow of water from the field into the surrounding drainage system. This will serve to protect houses in Horn Hill Road, Round Close Road and the Lucy Plackett field during times of heavy rain. Consideration has been given to dog walkers who currently use an unofficial access route to the footpath network with the option for the Parish Council to seek to formally recognise the route. Pedestrian access via the north-east corner of the field is also being suggested to avoid the need for villagers to utilise the main entrance on the Milton Road. WFAC members have included the Football Association’s recommended pitch orientation for the youth and adult playing areas. This means teams will generally play north-south, removing properties to the east and west from the line of play. WFAC’s plans do not include any permanent floodlights. The field will also include a new, modern single-storey community centre which will include a large main hall, capable of being divided in two, dance/keep fit studio, meeting room, fully functioning kitchen and bar area, sports changing rooms and a reception/café area. The proposed field design and building specification follows several months of research work including meetings with interested village user groups, consideration of existing facilities, site visits to similar projects, and meetings with officers from Cherwell District Council and the Oxfordshire Playing Fields Association. WFAC are proposing operation of the Milton Road field and building is under the control of an elected committee made up of user groups, trustees and interested parties with no one user group having any controlling interest. Suggestions were also made for improvements to the Lucy Plackett field to allow it to focus on community and family events. Ideas include an outdoor stage area, the resumption of cricket, a children's cycle track, creating a nature area, further play equipment and an enclosed dog exercise area as currently used at Kings Field in Bodicote. Improved parking would be possible and a decision on the building that may eventually be sited in the field could lead to the creation of a community café for those enjoying the surroundings. WFAC plan to submit their recommendations for consideration by the Parish Council this summer. Subject to agreement by Councillors the next stage of the project would include the engagement of architects and other professionals and a formal application for planning permission. In advance of WFAC’s work Adderbury Parish Council has already applied for permission to change the Milton Road site from arable to sports pitches and recreational use. It is understood the field layout supplied with that application was requested by Cherwell District Council simply as an indicative plan to demonstrate the field could be used in the manner the application requested. WFAC’s full presentation to members can be viewed on their website at http://workingforadderburycommunity.co.uk/presentation-from-members-meeting-2-may-2018.